Behold, the first punk automaton! This surreal Steamhead Gearpunk Ring is a combination of steampunk and gothic style, featuring a cranial opening that reveals the innermost workings of this unique and intriguing steampunk phenomenon. 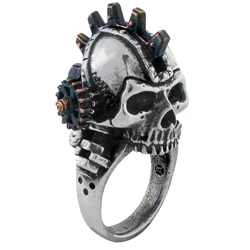 Impressive in its detail, this steampunk ring features a mechanized skull, all geared up and outfitted with all sorts of impressive accents, including gears and flywheels of various shapes and sizes. One gear even extends up through the skulls split cranium, creating a moving gearwheel mohawk that can be rotated on a whim. The ring is crafted entirely in polished English pewter, done in a two-tone coloration to allow the gears and steampunk elements to stand out. It is elegant and eerie all at once, as well as a stellar choice for the gothic gent or steampunk citizen to wear as a part of their daily look. Plus, the Steamhead Gearpunk Ring is a perfect way to infuse a bit of steampunk style or gothic greatness into your casual looks, too!